The phrase, “Worth its weight in gold” is completely overused. I’ve heard it applied to everything from denim to sparkling cider. When was the last time that you experienced something so good that someone could have weighed it, then demand payment based on the weight of the item multiplied by the price of gold per ounce? When you think about it in those terms it becomes difficult to find something that is wonderful, yet not so weighty that it becomes prohibitively expensive. For example: I purchased a 12″ Macintosh Powerbook back in 2005. It was the pinnacle of compact computing, and the best technology purchase I ever made. Unfortunately, 6 years ago the lightest computer on the planet still weighed 4.9 pounds. Using the price of Gold per ounce from the year 2005 ($427 per oz.) we can estimate a purchase price of nearly $34,160.00 (shipping included). While a great computer, it wasn’t worth a year’s salary. You read that right, on sale you’ll pay two dollars per bar. That my friends is a deal because they usually cost $3 per. How can this be? I’ll tell you, Magnum Bars are the smoothest ice cream you’ve ever had, dipped in the finest, silkiest, Belgian chocolate you’ve ever tasted. In the case of the Double Caramel, that bar is additionally dipped in two layers of caramel, then dipped again in chocolate. You’re probably uncontrollably wondering, “If this is true, then why haven’t I heard of this before now?” while salivating like one of Pavlov’s finest. 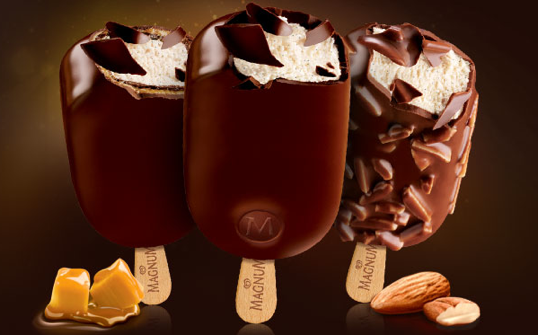 This is because Magnum brand ice cream bars became available to the U.S. Market this month. Until June of 2011, Americans had to be traveling abroad to experience the indulgence that Europe and the Mediterranean world were basking in. I can’t explain why Unilever (a soap company for pity’s sake!) kept away from the American market, but it’s not because Americans weren’t interested. In fact, American actors have been the faces of their international marketing campaigns for years. If you think that seeing Sawyer from Lost shilling Ice Cream bars is funny, it’s nowhere near as silly as the Turkish, romance novel commercials. In the end I suspect that our lack of Magnum bars had something to do with the French returning from an American vacation where they were led to believe that we enjoy the Choco Taco. However it shakes down, the Magnum bar is here for summer and if you are still sitting in front of your computer, get up, find three dollars in change and get to your nearest Shell gas station for an individual because the 3-packs are Already Gone… Kelly Clarkson! In life there are precious few things that a person is willing to overpay for (Cracklin’ Oat Bran anybody?) Who gets to gouge your pocketbook this month? Inquiring minds want to know. Seriously, go get a Magnum Bar. sounds wonderful as I am eating my mini hersheys assorted bag. Jess and I had a Double Caramel Bar tonight. You weren’t lying! It’s making me want one right now!